Remember those days of going with your mom to the eye doctor and picking a pair of frames only to end up totally hating them a few weeks later? Those round frames that looked cute in the flourescent lighting of the store only ended up resembling those of Harry Potter when you came home. It was always fun to try them on, but the endless comparing and contrasting only left you feeling overwhelmed – and ultimately making the wrong decision. Well we have some great news – trying on glasses just got 100% more efficient, easy, and fun! DITTO – the brand new and totally amazing online eyewear retailer allows you to create virtual 3D version of yourself via webcam. Check out the site, create your DITTO, and you’ll be staring back at a digitalized version of yourself (like an avatar!) and try on an endless selection of designer frames including RayBan, Chloe, Jason Wu and more. DITTO enables you to send images to your friends and fam so they can give you their input, and you can even get advice from an expert stylist! 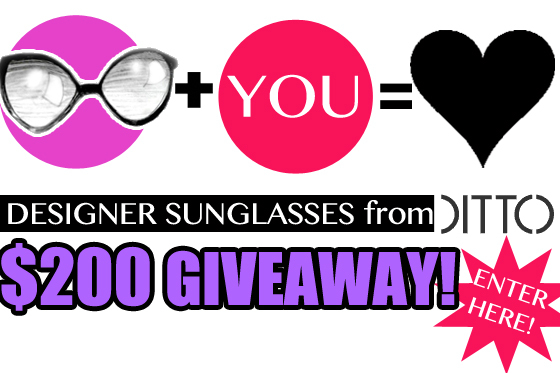 The contest will end at midnight PST on Friday August 3rd, so be sure to enter and to tell your friends before then!! We’ll announce the lucky winner via Twitter! PS: The beautiful sketch of the designer shades from our graphic was created by The Personal Cartoonist exclusively for TGIFguide!